When you supply any personal information to www.blackjackfuncasino.com, we have a legal obligation towards you in the way we use that data. We must collect the information fairly, that is, we must explain to you how we will use it and tell you if we want or pass the information on to anyone else. When using your personal information Blackjack Fun Casino will act in accordance with all current legislation in place. We will only use your information to contact you to give you a quote in response to an enquiry. We will then use this information if you book with us to organise your event. We may use your email to contact you if we believe we have a new product which may be of interest to you. We will not rent or sell your information into third parties outside Blackjack Fun Casino without your consent or are required by law. We are committed to ensuring that your information is secure. We maintain physical, electronic and procedural safeguards in connection with the collection, storage and disclosure of personally identifiable customer information. Our security procedures mean that we may occasionally request proof of identity before we disclose personal information to you. 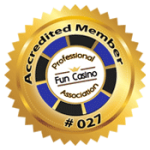 Blackjack Fun Casino use the Payment Service Provider World Pay to process all debit and credit card transactions. World Pay is PCI DSS (Payment Card Industry Data Security Standard) compliant to the highest level and maintains regular security audits, and all transaction information passed between Blackjack Fun Casino and World Pay systems is encrypted using 128-bit SSL certificates. Of course, data transmission over the internet is inherently insecure, and we cannot guarantee the security of data sent over the internet. A cookie, either temporary or persistent, is a small file which asks permission to be placed on your computer’s hard drive. Once you agree, the file is added and the cookie helps analyse web traffic or lets you know when you visit a particular site. For further information on cookies please visit www.aboutcookies.org.Cookies allow web applications to respond to you as an individual. The web application can tailor its operations to your needs, likes and dislikes by gathering and remembering information about your preferences. We use traffic log cookies to identify which pages are being used. This helps us analyse data about web page traffic and improve our website in order to tailor it to customer needs. RedKangaroo use the information to enhance our website, adjust our offers and increase our customer service. Overall, cookies help us provide you with a better website, by enabling us to monitor which pages you find useful and which you do not. You can choose to accept or decline cookies. Most web browsers automatically accept cookies, but you can usually modify your browser setting to decline cookies if you prefer. This may prevent you from taking full advantage of the website.